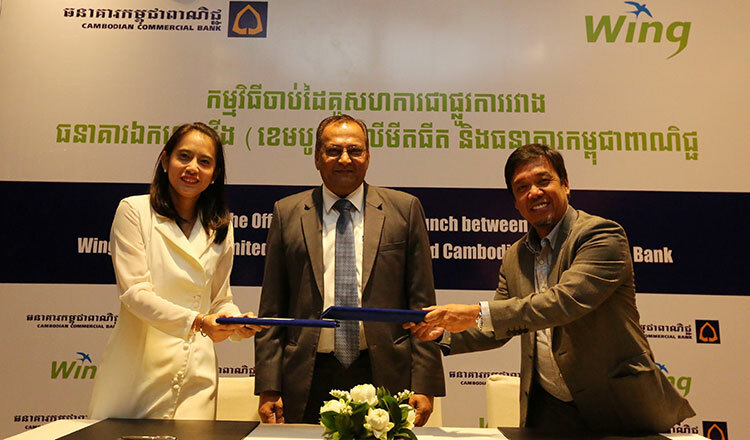 Wing (Cambodia) Limited Specialized Bank and the Cambodian Commercial Bank, a subsidiary of Thailand’s Siam Commercial Bank (SCB), yesterday signed a partnership deal that paves the way for the creation of money-transfer services with Thailand. An inward money-transfer service between Wing and CCB will be introduced in the next three months, while transfers to Thailand and other parts of the world will be launched in the near future. The partnership will help facilitate international remittances in and out of Cambodia by reducing service fees and improving transactional security, the banks said during a press conference. The main goal is to ease the process of sending money home for Cambodian migrant workers in Thailand, said Wing CEO Jojo Malolos. “In the next few months, Wing’s customers will be able to enjoy a new world of convenience in receiving money from Thailand via SCB’s service as well as other countries via SCB’s partners worldwide,’ said Mr Malolos. Cambodians can receive the money at one of over 6,000 Wing agents in the country or using the Wing Money app, he said. Wing’s customers in Cambodia can already receive remittances from over 200 countries around the world. Kamalkan Agarwal, head of international banking at SCB, said CCB will act as a bridge between Wing and SCB to ensure that this partnership delivers a significantly improved customer experience. “With the partnership, CCB hopes to commence a new chapter for international cross-border remittance in Cambodia by leveraging on block chain technology,’ Mr Agarwal said. There are now about one million Cambodian workers in Thailand, according to the Ministry of Labor and Vocational Training.